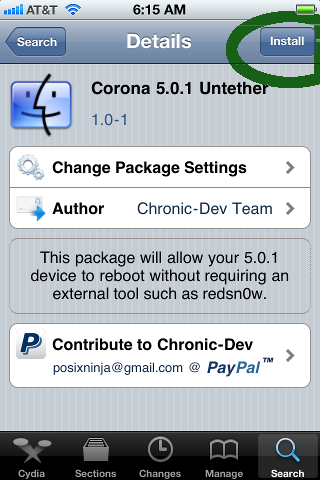 While iPhone Dev team released a new version of Redsn0w 0.9.10b1 that allows iPhone 4, iPhone 3GS, iPod touch 4G, iPod touch 3G and iPad 1, Chronic Dev released a jailbreak app called Corona iOS 5.0.1 Untether. Corona iOS 5.0.1 Untether allows users whose iPhone 4, iPhone 3GS, iPod touch 4G, iPod touch 3G, iPad 1 is on a tethered jailbreak to magically convert into a untethered jailbreak so that they no longer need to tether their devices to a computer to reboot them. Seems to be working just fine on my wife’s iPhone 4 running iOS 5.0.1 previously an untethered jailbreak. This saves a lot of time. Thanks to all involved. Sorry I meant previously a tethered jailbreak and now in untethered. Everything is working as it should xcept iBooks but that was expected. It's just what I need!Thanks for you awesome work guys! Check if you have Big boss repo added, then :Cydia > Changes > Refresh... Wait until it downloads and reloads newest packages. Then search again, should be visible now. Awwwwwww yeahhhhhh!... it works fine! Now... i waiting for a 4.11.08 baseband solution :( ! Do you need to keep corona installed or can you uninstall it after the original install? Will this work for 5.0.0? I have tethered Jailbreak Using Snowbreeze, since i am using gevy sim with preserve baseband.. Will this update work fine for my phone.